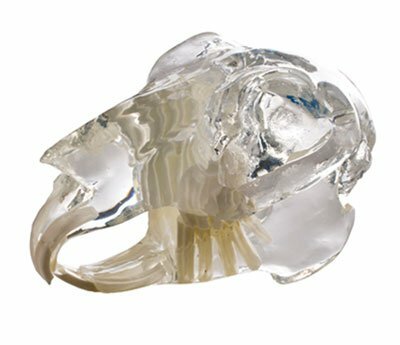 This is a see-through model of a rabbit skull that clearly demonstrates the relationship of their long and open-rooted teeth with the skull bones. This is a great educational tool for clients when a rabbit presents with dental-related disease. Rabbits have a very different dentition compared to dogs and cats and it can be quite difficult for those clients to visualise what is happening in their pet’s mouth. The model shows the layout, shape and extent of the teeth and the areas that have a close association. When a rabbit has a dental issue, this model allows them to visualise what I am explaining. Very often I see the client make the connection and understand the problem exactly. The model is specifically designed for clients and not as a refresher for vets. It doesn’t show a lot of the fine detail that is encountered within a rabbit’s skull. It is well made and can be handed over to the client to handle and explore. Many owners don’t even realise that in addition to the incisors, rabbits have 22 cheek teeth (premolars and molars). That information is often a bit of a revelation. The skull also comes with a plastic education card that demonstrates the pathway of the nasolacrimal duct, which is often a location for disease in the rabbit. While it’s fine for giving clients a general idea, the dentition is not 100 per cent accurate—though it’s only us practising rabbit vets who would notice. The other problem is that we have used this model so often that it has been bashed around a bit and caused some skull trauma. Our model currently has a zygomatic arch fracture!